Sure, we know that food and exercise go hand in hand, but sometimes with all of the information out there knowing what to eat before and after a workout becomes harder than the workout itself! Everyone’s needs are a little different depending on their goals, and type of exercise, but there are a couple of nutrition guidelines when it comes to what to eat before and after a workout that will ensure you a fueled up to perform your best and replenish your muscles properly after a sweat sesh. It’s very important to take into consideration how you feel depending on what you eat before and after a workout and how it makes you feel during it. It may require some trial and error to get it right but once you know what makes you feel your best you’ll be ready to take on any workout out there! Even as a dietitian sometimes I don’t fuel up properly or wait too long to eat after a workout and find myself not feeling so great. It happens! There will always be circumstances that prevent us from perfect execution but the bottom line is if you can roughly follow these guidelines and prepare in advance it will not only allow you to get stronger in your workouts, hep your body recover properly and take the guesswork out of what to eat before and after hitting the gym. Carbs are key. Prior to a workout we want to make sure our bodies have enough energy, and that energy comes from carbs. Carbs are broken down in our bodies into glucose and then stored in the muscles as glycogen. We need enough carbs to replenish that glycogen store when we’re using it up during exercise. You’ll want what you have before a workout to be mostly carbs with a litte bit of protein too. You’ll often see runners eating a plain white bagel when gearing up for a run because it’s a simple carbohydrate, which is easier to digest than let’s say a multigrain bagel with seeds (more fiber = slower to digest). Another fun fact here is that carbohydrate loading actually does not just happen the night before a race, you’re body can store carbohydrate 1-7 days in advance. Something to keep in mind if you’re a runner! Protein is also important for muscle protein synthesis and recovery. A small amount of protein paired with the carbohydrates before a workout provides amino acids to help reduce inflammation as well as build muscle tissue. When it comes to fat, even healthy sources of fat like avocado, nuts, and nut butter can be hard on the stomach to digest. Some people can tolerate nuts well before hitting the gym, but my recommendation is to keep consumption of this macronutrient at a minimum before the gym. Aim for timing of consumption to be 2-3 hours before your workout. If what you’re having is more of a meal than a snack air on the side of 3 hours and if it’s getting close to workout time go for something like a banana or a granola bar. Eating after a workout is super important--your muscles are literally hungry for energy so refueling properly is crucial for replenishment, preventing muscle injury and oh yeah to keep from being hangry! The optimal carbohydrate-to-protein ratio for this post workout nutrition is 3:1 (3 grams of carbohydrate for every 1 gram of protein). Research shows this carbohydrate-protein combination consumed within 30 minutes of exercise nearly doubles the insulin response, which results in more stored glycogen aka your body is ready and needing that energy vs. storing it as fat. This stored glycogen is then ready to fuel your next workout! I rely on a few fool-proof snack and meals ideas that I try to always have in my fridge or in my bag so that I can refuel soon after a tough workout. Timing is also an important part of the refueling equation. Some might not be as sensitive to waiting longer to eat after a workout, but I know for me it’s key to eat within 30 minutes to an hour after a workout. Aim for timing of consumption to be within 30 minutes to an hour after a workout for the reasons stated above! Staying hydrated before and after a workout is also equally as important as what you eat! Dehydration can cause muscle cramping, and overall fatigue going into a workout. Here again, there’s no one-size-fits-all method to determining fluid needs during exercise, a good place to start is drinking about 2 cups of water 2 to 3 hours before exercise and 1 cup of water 10 to 20 minutes before working out. Being cognizant that you are working out that day and staying on top of your water intake (aka refilling a reusable water bottle a few times) will help ensure you are feeling good all throughout the activity. In the hours after exercise, people should aim for approximately 16 to 24 ounces of fluid for every pound (0.5 kg) of body weight lost during exercise to replenish fluids. After more intense workouts consider opting for coconut water to help replenish electrolytes like potassium and magnesium lost through sweat. These minerals are also super important for proper muscle contraction and relaxation, so if you like the taste this is a smart hydration option! This post was sponsored by WP Rawl. All opinions are from Maggie Michalczyk, RDN. Nicole Yon, RD on her family’s cattle farm. If I had to pick just a few words to describe my eating style it would be “nutritious convenience.” As a registered dietitian I am well versed in what it takes to build a satisfying and healthy plate, but given our hectic schedules on the farm - I also don’t have much time to spare for elaborate and nutritious meals. Since I’m not willing to sacrifice nutrition in the interest of time, I depend a lot on simple meals and healthy conveniences such as Nature’s Greens pre-washed Greens. Growing up Saturday night always meant pizza night in our house. As a child my favorite flavor was Hawaiian Pizza (ham and pineapple only!) and I enjoyed helping my dad make the dough from scratch, spread the sauce, shred the cheese and dress my own pizza before peering through the oven glass watch it cook. These days pizza nights looks a little different in our house, but my husband and I carry on the tradition by eating pizza almost every weekend. While I still enjoy a Hawaiian pizza every now and then, we use a few more convenience items like pre-made crusts and triple washed Nature’s Greens Kale. By making pizza at home (as opposed to grabbing take out or a frozen pizza) we can control a few more of the ingredients and a healthy version of one of our favorite foods! 2. Prep veggies by slicing roma tomato, chopping red onion and massaging kale greens with oil. 3. Spread pesto sauce on pizza crust. Follow with a layer of roma tomatos, red onion, shredded mozzarella cheese, and protein of choice. 5. Bake pizza in preheated oven on a cookie sheet for 8-10 minutes. If you’re anything like me, you might love the combination of chocolate and peanut butter and you probably hate to buy an ingredient that can be only used in one dish. After making kale pizza, I like to use my leftover kale greens in smoothies through out the week! Having pre-washed Nature’s Green’s kale makes it even easier to throw together a quick and nutritious smoothie in the mornings and my favorite ones also happens to taste like chocolate and peanut butter! I can often feel intimidated by recipes I see on Instagram or Pinterest that require uncommon ingredients or special powders. The truth is, you can make a nutritious smoothie with a few basic ingredients and I love making “good for you” and filling smoothies by this simple formula: 3 cups green, 2 cups of liquids, 1 cup of fruit and a few tablespoons of “extras.” Extras could include peanut butter, cocoa powder, maple syrup, ginger, turmeric, cinnamon, or honey! I find this smoothie to be a great option for busy mornings and might pair it with a few hard boiled eggs for a quick, on-the-go, protein packed breakfast! 1. Combine banana, peanut butter, yogurt, milk and cocoa powder in blender until smooth. 2. Add kale greens and blend until smooth. This blog post was sponsored by WP Rawl and written by Nicole Yon. All thoughts and opinions are hers. 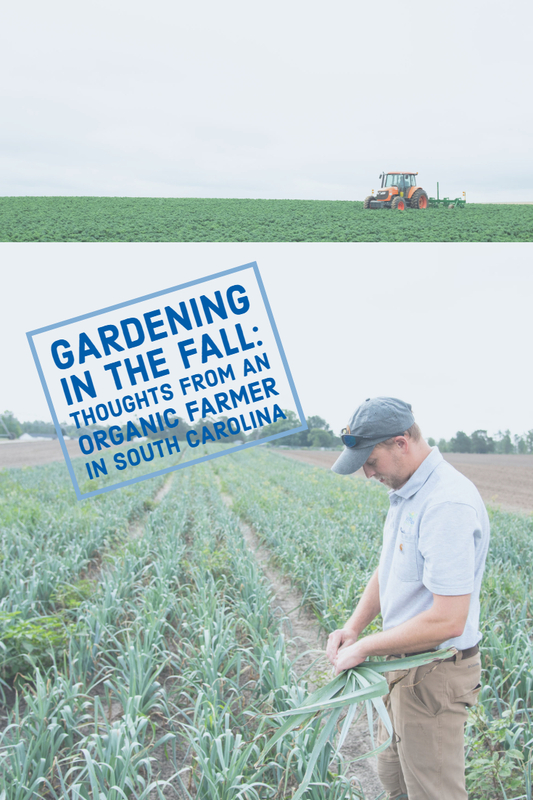 Based on our experience at WP Rawl, we believe large farmers and small gardeners alike are presented with an ideal growing environment during the fall here in the Midlands of South Carolina. When most growers in the country are starting to think about winding down and preparing for winter, we Southern growers can start thinking about all the bountiful homegrown meals we can make for our friends and family. Ultimately, that’s why we at WP Rawl do what we do. Knowing that our family, friends, and neighbors are choosing our product when they go to the grocery store makes all our hard work worthwhile. So what can you do to turn your plot of land or corner in your backyard into a bountiful harvest? Well, first of all you’ll need to prepare the ground by turning the soil over with either a tiller or a shovel. The goal is to break up the large chunks of sod or dirt so that you’re left with a smooth, weed-free plot of ground. Turning the soil helps break up large clots of dirt, get rid of weeds, and creates a nice smooth seedbed ready for planting. Next, you’ll want to take a look at your soil and think about how your vegetables will get the nutrients they need to grow. If you have sandy soil, you’ll need to fertilize and water your plants more often since sandy soils don’t hold nutrients or moisture well. If the soil is harder to break up and sticks together in clumps, then you’ll have to work a little harder to prepare your plot, but it also means that most likely you have better conditions to grow vegetables. Compost is the greatest material asset we have to improve our soils here on the organic farm at Rawl. After just three years of mixing compost into our soil before planting, we have seen a massive increase in productivity and plant health. In my opinion, adding as much well-made compost to your garden as possible is the best thing you can do for the crops you plan to grow. There are local companies that sell or give away compost, and it is also sold in 1 to 3.8 cubic foot bags at most large hardware stores. The minimum I would suggest to add is 3” of compost on top of your garden. There are many gardening sites that do calculations for you, but an example would be: 2 cubic feet of compost covers an 8 foot by 8 foot garden plot with 3 inches of compost. Now we get to the fun part: planting! Here in the Midlands, we have few limitations as to what can grow well in the fall. If your plot is ready mid-July to early August, you’ll have the largest selection of vegetables to choose from. We at WP Rawl primarily grow “leafy greens”: kale, collards, and mustard greens, along with cilantro, parsley, green onions, and leeks. They are incredibly popular, especially during the holidays, and this time of year is well suited for their growth. Along with leafy greens, lettuces, broccoli, cauliflower, spinach, beets, carrots, turnips, and radishes are perfect candidates for fall gardening; they all thrive in cool weather and even improve in flavor with a little frost. It’s even possible for backyard gardeners in this area to start late-season tomatoes in July and August if they’re ambitious. They require more care and knowledge than most vegetables, but there isn’t anything quite like eating a homegrown tomato fresh off the vine. Root vegetables, such as beets and carrots, should be started from seed in relatively weed-free soil any time from August 1st to mid-September. Spinach and lettuce can also be grown easily from seed, but planting them as transplants will also work. Vegetable transplants are generally 4 to 6-week-old plants grown in multi-cell trays or small pots started in a climate-controlled greenhouse. Most nurseries and hardware stores will probably be running sales on their transplants in the fall because they don’t want to keep these plants through the winter. Leafy greens (kale, collards, mustard greens, etc.) will grow better if you plant them as transplants. After you’ve prepared your soil, spread your compost, and planted your seeds and transplants, the most important thing you’ll want to do is keep the soil moist and weed-free. Hoeing or pulling weeds once or twice a week is ideal, and also a great family activity that gets everyone outside and involved with the bounty to come. Watering twice per day while it’s still hot should be enough to get your seeds to pop up and your transplants to take root. You want to keep the ground moist, but not so wet that you leave puddles. As your garden matures and fall really sets in, cooler weather and more frequent rain means you won’t have to water as much. If you see that your plants are slowing down in their growth, a tablespoon of organic garden fertilizer per plant is plenty to get them going again. If you’d like to fertilize your entire garden on a regular basis to ensure consistent growth, you have a couple options. The first: add about an inch of compost to your garden every 2 to 3 weeks; rake it into the soil around the plants gently and be careful not to get it on the leaves of the plant because the concentrated nutrient levels may burn the pllant if it sticks. The second option: every 2 to 3 weeks sprinkle your organic fertilizer of choice at the suggested amount (there are many options at the hardware store or nursery to choose from, but a standard organic vegetable garden fertilizer will work just fine). Depending on what you grow and the conditions of your soil, you should be able to start harvesting the spinach and leafy greens after about 30 to 40 days. Picking individual leaves, instead of cutting down the whole plant, will allow you to harvest for several months or until a hard freeze sets in. For the root vegetables, radishes will be ready in 20 to 30 days, about 45 days for baby beets and carrots, and 60 to 70 days for them to fully mature. It is a big responsibility to care for a garden, but it doesn’t need to be seen as a hardship. I've discovered that all work is better and usually more enjoyable when shared with others. Everything from land preparation to planting to watering to pulling weeds offers the whole family an opportunity to get involved in an incredibly rewarding outdoors activity. Some of the best experiences I had as a child came from helping my mom cut lettuce for that night’s dinner. Here in the Midlands, nature has given us the gift of beautiful and often bountiful fall seasons. I would encourage families and individuals alike, to try a fall garden in the South at least once. I sincerely believe you’ll be amazed at what a little hard work and commitment can produce. I encourage anyone with questions about gardening, or wanting to share their experience, to please reach out to me (mark.spicer@rawl.net). I would love to hear from you!